Since the move to competition in the 1990s, the power industry has not faced such potentially fundamental shifts in business and operating models as it is now confronted with. David Perez of Enite discusses those shifts and shares proven methodology to successfully evaluate and select the right technology to meet these demands and provide more comprehensive risk management. Power utilities in the United States are currently contending with a wide range of challenges. The industry lived through a sharp decrease in power demand during the recent recession and has experienced only sluggish growth since then. Moreover, the industry has navigated regulatory uncertainty for years now, as a range of environmental and market policy measures have been first proposed and then often rescinded through litigation. Since the move to competition in the 1990s, however, the sector has not faced such potentially fundamental shifts in its business and operating models as it is now confronted with. The extent and nature of these shifts vary from market to market, however, in many markets, their intensity is making their influence transformational rather than incremental. The biggest changes affecting utilities, and the ones that companies take lightly at their own peril, involve the boom in renewable, micro-grid energy and distributed power systems. The technology gains made in these areas have altered the business equation such that the customer is rapidly becoming the dominant force, a paradigm shift for an industry that has traditionally been led by virtual monopolies. Utilities are finding it increasingly difficult to respond to and manage these market changes and operational risks. Boards are no longer able to responds to market / industry changes through their own experience and are becoming increasingly dependent on centralized analysis that leverages new technologies capable of incorporating data inputs across enterprise, market, operational and social data. In the following section we will explore proven methodology to successfully evaluate and select technology to meet the demands for more comprehensive risk management. Effective system evaluation and selection is critical to ensure that a chosen system will accommodate the inevitable market and operational changes inherent to a utility, while also meeting its business and technology needs. 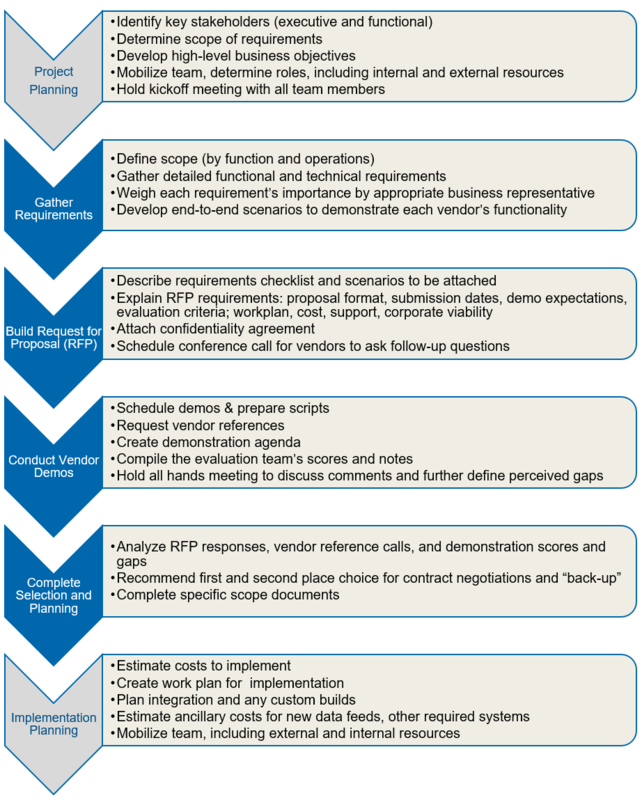 A thorough system selection process will provide more than simply choosing a system—it will identify and document the requirements of the effort, identify the requirements a system will be evaluated against, provide quantitative and qualitative rationale for any chosen system, identify the major gaps to be addressed during contract negotiation and facilitate the development a solid project plan. Understanding our client’s evolving challenges, Enite is in a position to hit the ground running and deliver quickly with system selection experience across all functions of a utility. Enite also has deep knowledge of vendor capabilities/limitations, understanding of industry practices, and extensive project management and negotiation skills to help you make a sound decision based on a thorough and objective analysis. Enite’s significant direct experience is pivotal in helping our clients choose a system that will address both the market and operations complexities of a utility, while also meeting their IT needs. Enite can help answer these questions and more, ensuring a successful system selection. To discuss opportunities, please contact David Perez at david.perez@enitegroup.com.